This is one of my favorite Christmas carols on the piano. I have always enjoyed playing this one at home, in church and for various gatherings. Silent Night, Holy Night speaks to the peace of Christmas. It is a piece of music that signifies Christmas even if the words are silent. It feels like I am walking with Josef Mohr and I can almost picture the view from the hill that he sees. Track #1 of 15 songs on Christmas Piano. 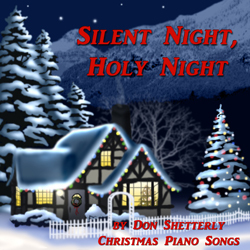 Silent Night, Holy Night was written in 1818 by a minster, Josef Mohr in Austria. The story goes that because the church organ was not worked and would not be repaired before Christmas, that a roving band of actors performed the story of Christ’s birth in a private home. As Josef Mohr was walking home, he was reflecting on the play and taking a long path up over a hill overlooking the village. He remembered a poem he had written a couple of years before about the angels announcing to shepherds on a hill, the birth of Jesus. Shepherds hear the angels sing: Alleluia! Hail The King! Jesus the Saviour is here, Jesus the Saviour is here. Full of heavenly joy, Full of heavenly joy. See the eastern wise men bring, gifts and homage to our king! Silent night, holy night, Wondrous Star, O lend thy light! With the angels let us sing, Alleluia to our king! Jesus our Saviour is here, Jesus our Saviour is here.